With 24 sturdy pages and a size that's just right for little hands, these delightful board books can be used together to form an ordered framework of prayer for your preschooler. Each one features beautiful, colourful illustrations and simple, yet meaningful text that emphasises the personal relationship your child can enjoy with God each day. From Candle. 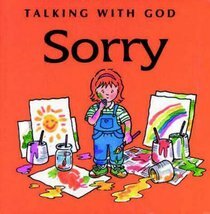 About "Sorry (Talking With God Series)"
This delightful board book is just the right size for little hands. A 24-page mini board book to help the very young explore their world and discover God's love for them. They can also be used as a framework for prayer. One of a series of three.